This is a powerful stone that helps you to release fear and anxiety and aids harmony and balance.It stimulates taking action, and helps you to make decisions with discernment and understanding, and unclouded by your emotions.Tigers eye can benefit those who are suffering from mental health problems or personality disorders.It will help in resolving mental conflicts by integrating the energies in your brain and making you think more clearly.It’s also good in clearing sinus congestion's and easing vision problems.It will help increase metabolism and keep your energy levels up.Tigers eye stone is also known to help in healing broken bones and facilitating a quick recovery from neck or spinal problems.It can clear toxins from the body and give you the strength to recover from whatever is ailing you Owning a tigers eye stone is also an invitation to be more physically and mentally active.It will bring good luck to you when you work hard and envision your success. It can amplify the energies that you give to your pursuits, which is why it will also attract the same amount of good luck back to you.Tiger eye stone will work in strengthening your willpower and your intention to succeed. That sense of inner courage and conviction will help you when the world around you seems unstable and uncertain.In times of chaos, it’s very tempting to shore up, wait out the storm and put our best ideas to bed. The fear of failure is a perfectly natural human characteristic, but it can so easily also dissuade you from making the progress you deserve.Meditating with tiger eye stone will help you connect to your ambitions, but not let them capture you and whisk you away on flights of fancy. Instead, you’ll find you have the pragmatism to put your plans in motion with measured, intelligent steps – but also the bravery to follow through when others are playing it safe.It will help you increase your wealth and practice good judgement while doing so. It will also decrease your desire to spend on a whim and help you resist excessive spending.It’s a stone of good luck and fortune, best for entrepreneurs or those who will be entering the business world for the first time.However, even if you are not an entrepreneur, the tigers eye energy can help bring your dreams and desires to fruition.It will stimulate the base chakra, sacral chakra and the solar plexus chakra, where its energy has a very powerful effect.The vibration of 'the will', which is the predominant energy of the solar plexus chakra is strong within Tigers Eye Stone, and its energy here also aids the release of fear.This natural crystal balances the brain, so it may be of benefit to help those who are suffering from mental disease or with personality disorders.It is the balance within the stone that is its most practical attribute. While it is a stone of balance, it will help you to more easily see both sides of a situation.It would be helpful for you to have on you, if you are a negotiator or mediator in any situation.It will inspire commitment to a project. It will challenge your way of thinking and make you forego the safe and just try something new. It is believed to ward off the evil eyes from the wearer. It also keeps away the evil spirits and gives immense self confidence to its possessor. Tiger Eye is most effective on Root chakra and Solar Plexus chakra. Root chakra exists at base of spine and helps to enhance the health and prosperity in life. By working on solar plexus chakra, it boosts the self confidence and inner strength. .
Tiger Eye is quite beneficial to bring focus in mind. It also improves the stamina and re-energizes the senses. It helps the wearer to stay grounded and eradicates the doubts from the mind. It is, in fact, a good luck bringing stone that protects the wearer from evil thoughts and ill wishes of enemies. It also possesses many healing properties. Tiger Eye reduces the chronic pains, improves the strength of spines, and detoxifies the body. It also relieves stomach and digestion related ailments. Astrologers also suggest this stone for children who have problems like lack of concentration, insomnia, or impatience. It is also advantageous to wear Tiger Eye for individuals who are quite stressed out in their life. 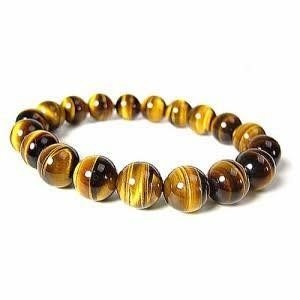 Tiger Eye also brings monetary gains to the wearer and improves the financial standing. Hence, it is widely recommended for businessmen as well. It is a universal stone that can be worn by people related to any zodiac sign and gender, religion or age. It increases their vigor, honesty, determination, and vitality. This stone is specifically beneficial for shy people as it can boost up their self confidence and personality disorders by removing their timidity.